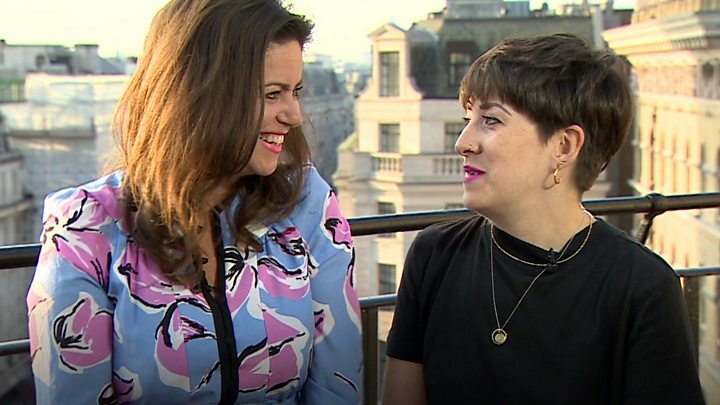 Media captionDeborah James and Lauren Mahon have said they will continue with 5 Live's You, Me and the Big C podcasts. Rachael Bland's co-presenters on the You, Me and the Big C podcast have spoken about their "pride" in continuing her legacy after her death. The BBC Radio 5 Live presenter, who had breast cancer, died on Wednesday. Deborah James and Lauren Mahon said they had been "overwhelmed" by the response to the 40-year-old's death. "From all the outpourings we've seen in the last 24 hours, I think that she smashed it," Lauren told BBC Breakfast on Thursday. Rachael's husband Steven tweeted on Thursday, thanking those who had made tributes to his wife, including her podcast colleagues. Lauren said they will "find a way that feels right" to continue the podcast as "all she wanted was for no-one to feel alone in their cancer journey". "That woman changed my life and she changed it for ever and for the better," she added. "She's shown me what it means to be courageous, shown me what it what it means to be professional and shown me how to just have class through it all. "And I'm proud and honoured to have just been in her life and she's in my heart forever and we will do her proud." Deborah said it was was important to keep talking about their "phenomenal" friend, however hard it was. "It's so painful to have to stand here and go through this but seeing the impact and seeing the response and knowing how we've made a difference is overwhelming. "So, yes, we have smiles to celebrate what she's actually achieved." Rachael had tweeted that the podcast would continue when she revealed she had been told she only had days to live. Deborah said she had found "massive comfort in terms of the way that Rachael spoke to us about her wishes." "I woke up this morning wanting it not to be real but then I also woke up with an immense sense of pride in terms of what we've been part of and I'm honoured to be part of that and we want to continue being part of that conversation. "I've never felt such a great sense of purpose in terms of what we need to continue to do." Lauren said: "She was determined that we continue the podcast. This was her wish to us and the BBC that we continue the conversation. So we will uphold our end of the bargain for our Rachael. "We'll find a way to that feels right - no-one's sitting in her chair unless it's Jennifer Aniston," she said, laughing. Deborah has stage four bowel cancer and said Rachael was the first person she told. She added that in their darkest moments, Rachael would send her "death jokes". Deborah said Rachael had an "amazing ability to flip the most horrible situations into something I can look back on incredibly fondly." She added: "I hope when I continue on my cancer journey I can take a little bit of that energy and that humour from Rachael moving forward." Rachael got in touch with Lauren, who also had breast cancer, two years ago and got her involved in her acclaimed podcast. It addresses some of the practical matters faced by those with cancer including hair loss, tips for dealing with finances and telling your nearest and dearest.